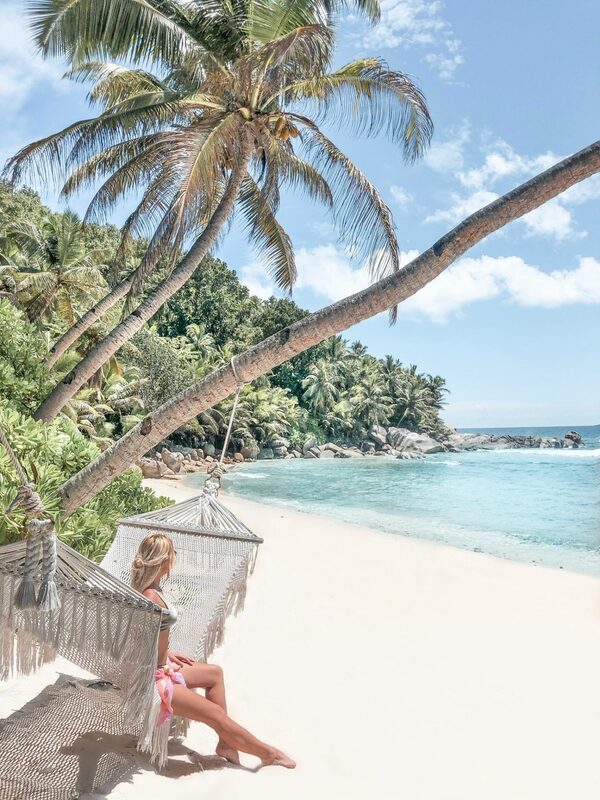 Visiting the Seychelles Islands was a dream come true. Ranked #1 on my 2018 bucket list, I am so grateful to have been able to tick it off my list. I visited this past November and it exceeded my wildest dreams. Located in the Indian ocean, the Seychelles islands are a group of 115 unique and pristine islands off the coast of East Africa. 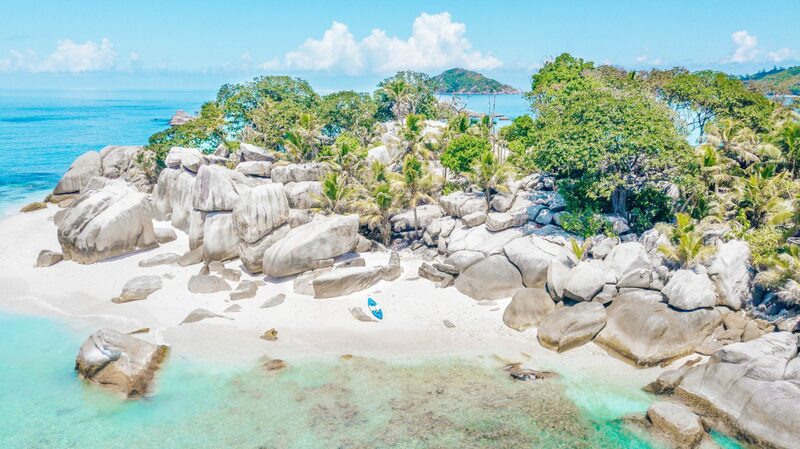 With white sand beaches lined with the lush tropical forests and enormous granite boulders strewn across the land, you quickly see why these islands are ranked among the best in the world. They truly feel like heaven on earth. Being a sucker for unspoiled landscapes and lush topography along the seaside, the Seychelles had me in awe from the moment we arrived. No words or pictures can describe the unique natural beauty found in this corner of the world. These islands are truly one-of-a-kind. Getting to the Seychelles is not as tough as it might seem. There are several options in reaching these remote islands. Flying through the Middle East is typically the most popular option but direct flights from Paris are also available to their main island, Mahé. If choosing to connect through the Middle East, both Emirates and Etihad offer daily 4-hour flights to paradise. 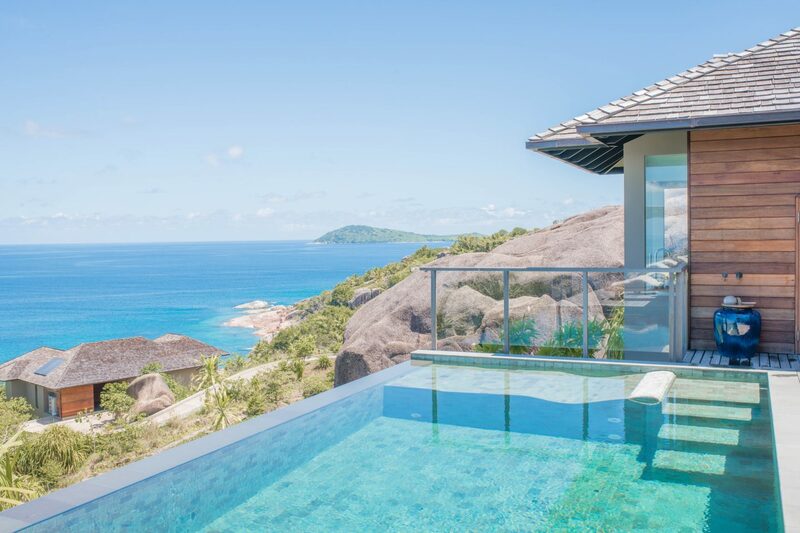 Once you arrive in Seychelles, there are plenty of resorts on the main island making land travel quite easy. However, if you are staying on an island off the coast, rest assured there are many transfer options. Whether you choose to take ferry, private boat, plane or helicopter, you will reach your final destination in under an hour. Upon arrival to Mahé, we set to reach our final destination at Six Senses Zil Pasyon. On a private little island 35 minutes from the main island, we finally reached Félicité Island. 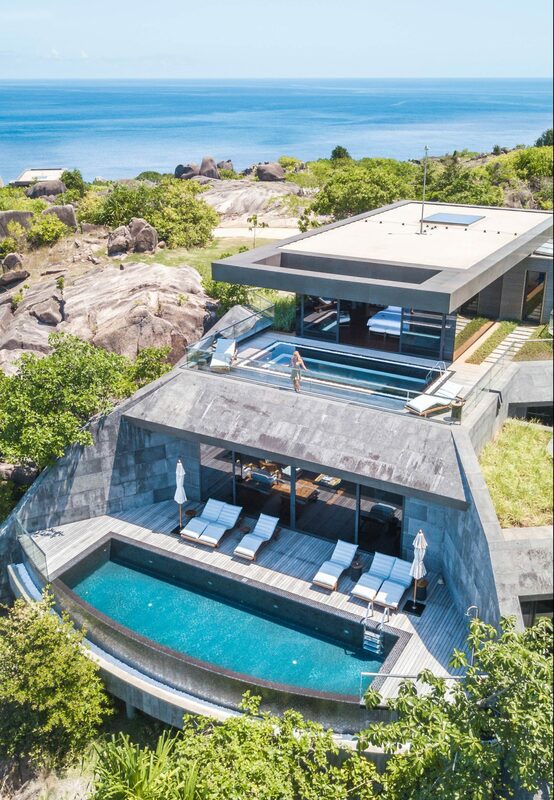 The beautiful home to Six Senses Zil Pasyon. 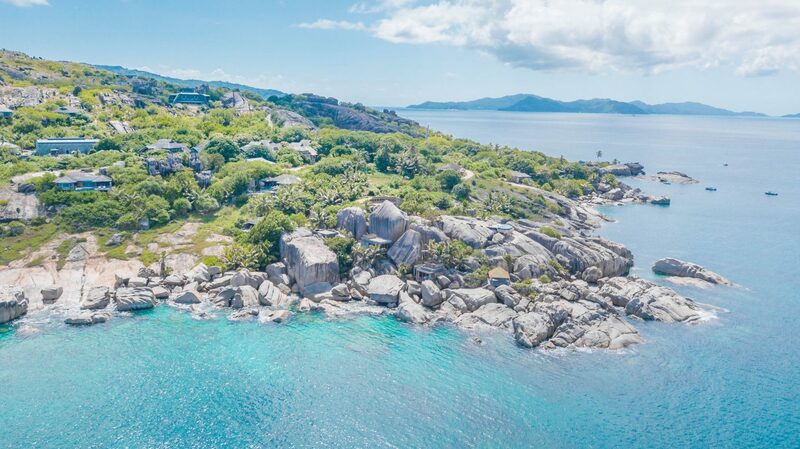 Félicité is the 5th largest island in Seychelles at just under 3 SqKm. The small island is heavily forested with rocky granite terrain and a coastline of untouched beaches. With only 30 private villas found on the island, it truly feels like your own personal paradise. 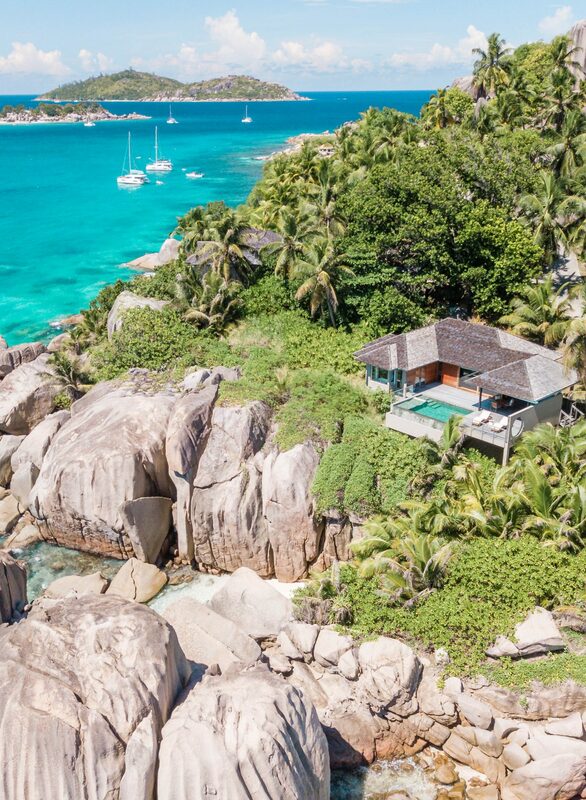 It goes without saying that Six Senses Zil Pasyon is the perfect place for a special honeymoon, anniversary or romanic retreat. 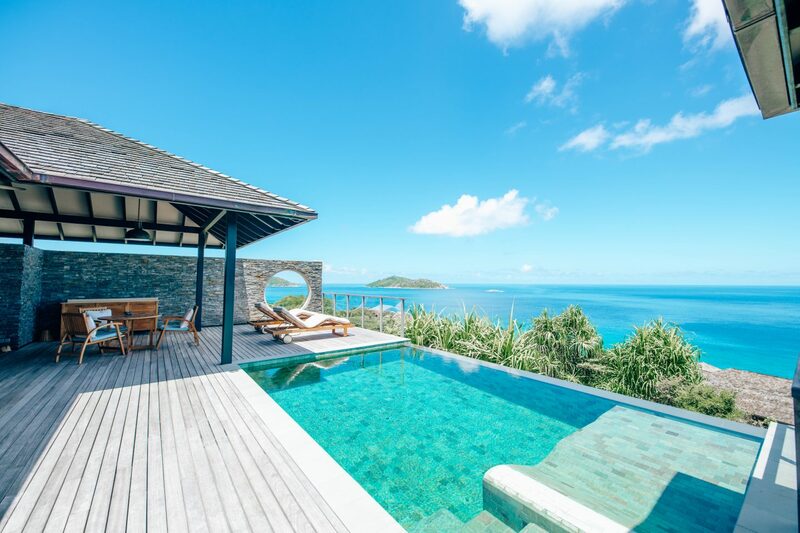 Each villa occupies their own private perch on the island. 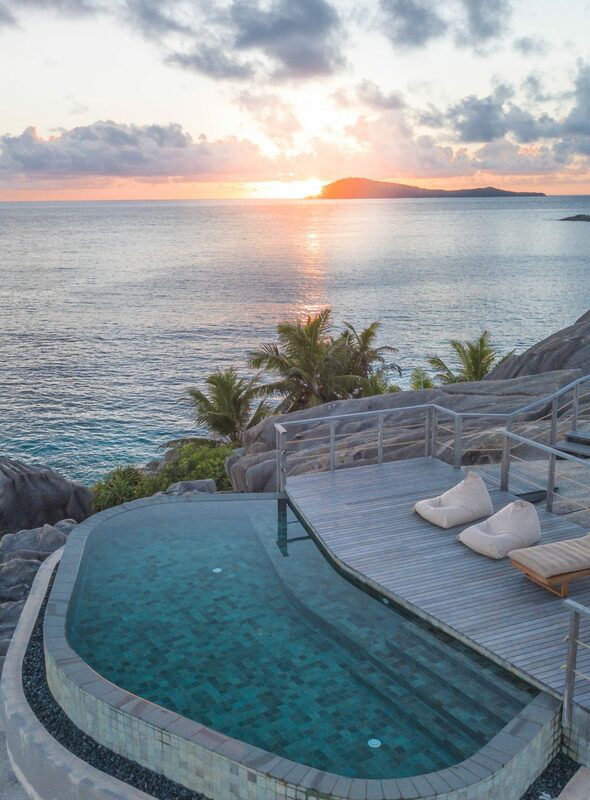 The vantage from their villas offer astounding views of the sea and the tiny neighbouring islands to Félicité. What a dream! Checking in was such a delight and couldn’t have been more seamless upon arrival. We had villa #15, their panoramic pool villa. Our villa was very spacious with a bright and tropical feel. With a one bedroom suite, dressing area and large bathroom, it was almost bigger than our condo back home! The sliding doors from the bedroom spilled out onto the vast outdoor deck with an infinity plunge pool overlooking the sea. Along with the villa you get your own personal G.E.M (Guest Experience Maker). As the name suggests, they truly are gems! The GEMs are responsible for arranging everything during your time on the island, from dinners and activities to departure transfers. We were delighted to be acquainted with Ahmed, our friendly and attentive GEM from Egypt. He provided impeccable service throughout our stay and made a very memorable impression on us. 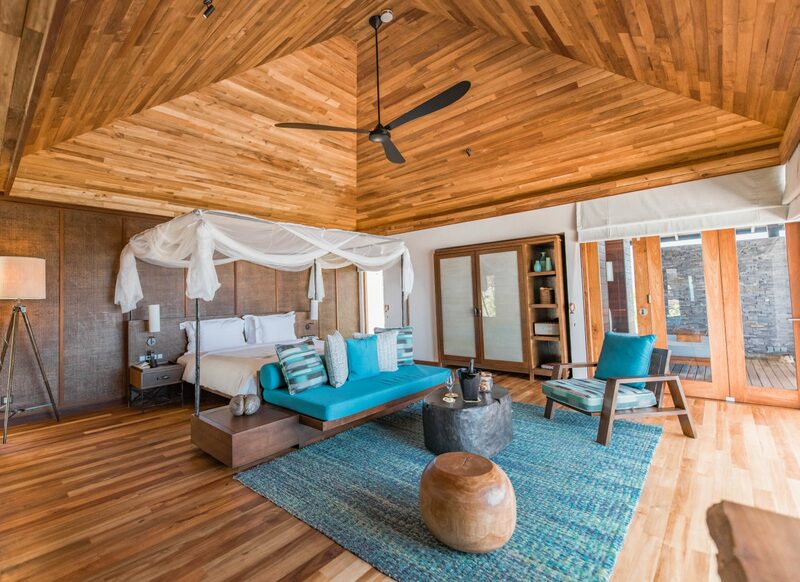 This touch by Six Senses is what truly makes them world class in service. The villas are designed so that you never have to leave. With dining areas indoor and out and the perfect pool overlooking the sea, you can spend days on end here enjoying the life of luxury. Being relatively landlocked on this paradise island wasn’t really a concern. Aside from relaxing in your private villa, there are tons of activities to enjoy on the island. We began the week with a guided hike through the lush island forest. During the hike we got to learn about the local vegetation and the famous Coco De Mer. The Coco De Mer is a rare species of palm tree native only to the Seychelles. The name is French for “coconut of the sea” and the rare tree produces the largest seed in the plant kingdom. The hike ended at the highest point of the island offering the best view of the sea and neighbouring island. Throughout the week we relaxed on their pristine beaches and enjoyed some water sports off the coast. We spent an afternoon snorkelling around the nearby reef and kayaked one day to the neighbouring island, Coco Island. At night, it was a ritual to watch the sunset from their oceanside day beds while enjoying a delicious cocktail. On some nights after dinner, they offered movies under the stars next to the sea. Such a romantic setting for a movie. 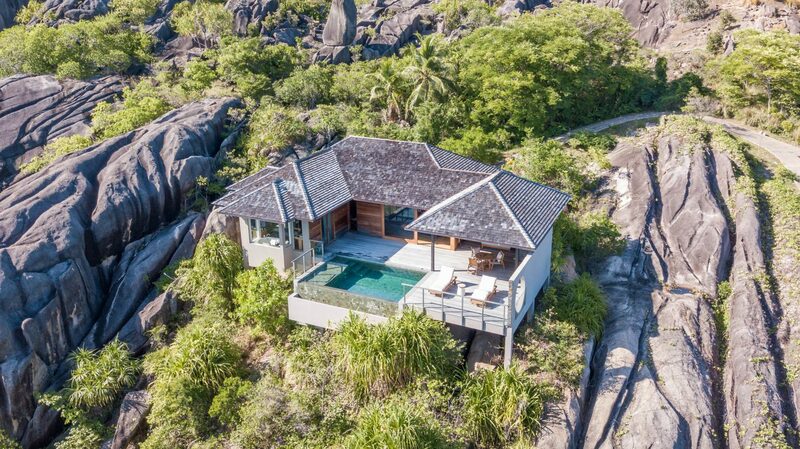 If leaving the island is what you desire for a day, Six Senses offers transfers to nearby La Digue twice weekly. La Digue has many of things to see and do with the famous beach. For being a relatively remote island in the middle of the Indian Ocean, the food was incredible. All meals were exceptionally fresh and uniquely prepared. Many early morning were spent dining on our villa terrace for breakfast. The in-villa dining option was always an excellent choice as we were able to enjoying the breathtaking views. The food always arrived promptly and the service was wonderful. Each night there were two main options for dinner. We were able to chose from their daily theme experience, which had different nightly selections offering a range of dishes from Asian, European and African cuisines. And if we weren’t into the nightly theme, we could choose to dine at their sea side restaurant which served fresh seafood with a Creole twist. Each meal we enjoyed was paired with a meticulously selected wine by their fabulous sommelier, Lucas. His world experience and sophisticated palate made sure we had the best wine selected with every meal. 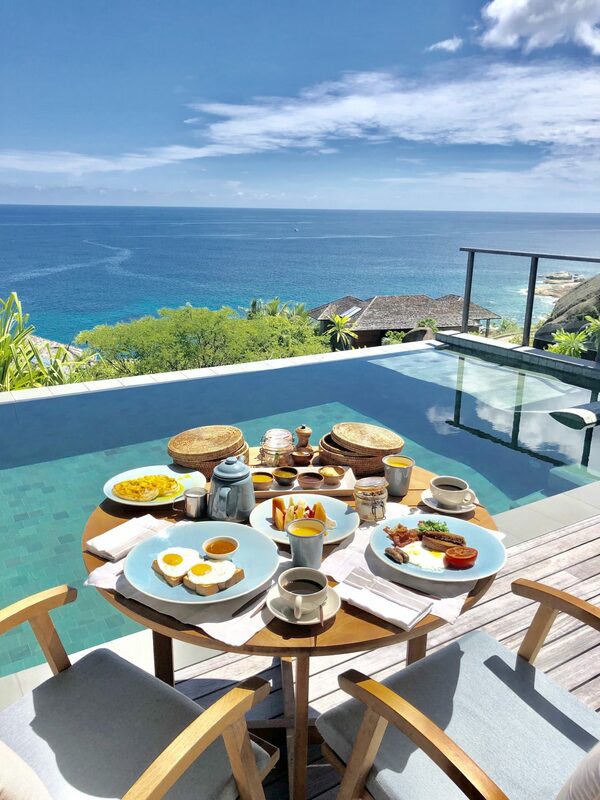 If traveling for a special occasion, Six Senses also offers a one-of-a-kind, intimate dining experiences. You can dine atop of a cliffside for dinner while you enjoy the sunset and breathtaking views. And for a breakfast option, they offer a romantic breakfast for two, picnic style on the beach. Such a lovely way to start the day next to the soothing sound of the waves. Beyond the various options and wonderful cuisines served for each meal, the staff are what truly made dining special on the Island. The service was always outstanding and each staff member was pleasant, friendly and welcoming. 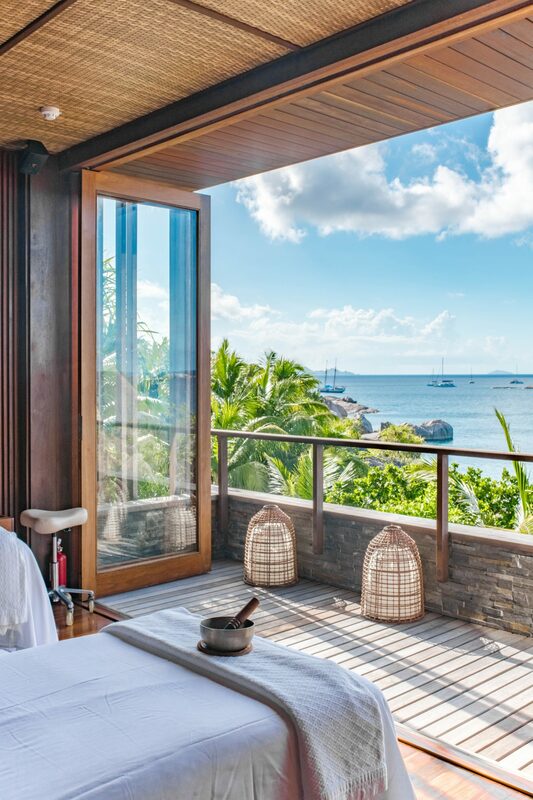 Six Senses Resorts are certainly known for their ultra-luxurious, world renowned spas. The brand embodies sustainability and holistic wellness in all aspects of their resort and their spas are a true testament to this passion. The spa at Zil Pasyon is remarkable. 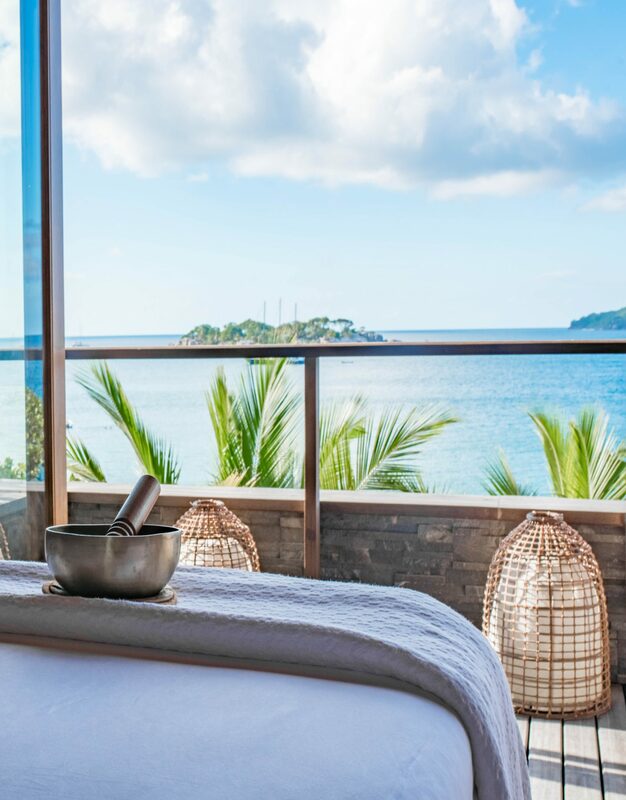 Nestled into the cliffside leaving the natural boulders and surrounding vegetation intact, the spa is a unique experience connecting all of your senses to the astounding environment that surrounds you. 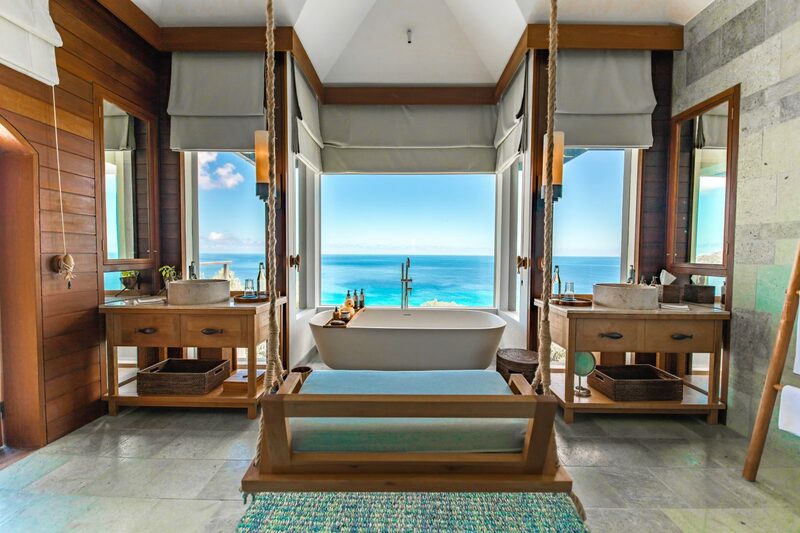 They have 4 open-concept treatment villas that offer direct views to the sea. The villas are spacious with the large treatment area, private outdoor shower, change-room, restroom and outdoor terrace to relax before and after your treatment. Also within the spa you will find their sea side pool deck and yoga pavilion. If not visiting for a treatment, I highly recommend coming by to enjoy the amenities. At the heart of every Six Senses Resort, you will find their sustainable practices for a better world. At Zil Pasyon they are passionate about the brands vision for sustainability. They are 100% free of disposable plastics, including water bottles, straws and food disposables. And by 2022 they plan to be completely plastic-free. On the island they desalinize their own water, making clean drinking water for all staff and guests in glass bottles and burn their own waste created on the island so that little waste leaves. Their sustainability manager, Ana, is a marine biologist with a strong passion for conserving the heath of our oceans. She leads the largest coral rehabilitation projects in the Seychelles and personally cultivates thousands of pieces of coral with her team on the island. We had the pleasure to experience her efforts and see the growth of healthy corals off the Félicité island shores. During our stay we had the rare sighting of a sea turtle laying her eggs on the shore. Ana was insistent on making sure these eggs would have a healthy environment to hatch. She woke up before sunrise to carefully move the eggs to a safe location away from the tide. Sure enough, 1 month later, they hatched! I was excited to see a photo captured of the baby turtles as they scurried to their new home in the sea. The sustainable passion witnessed at Six Senses was truly heartwarming. It gives so much more meaning to luxury travel when you know a hotel is doing their part. 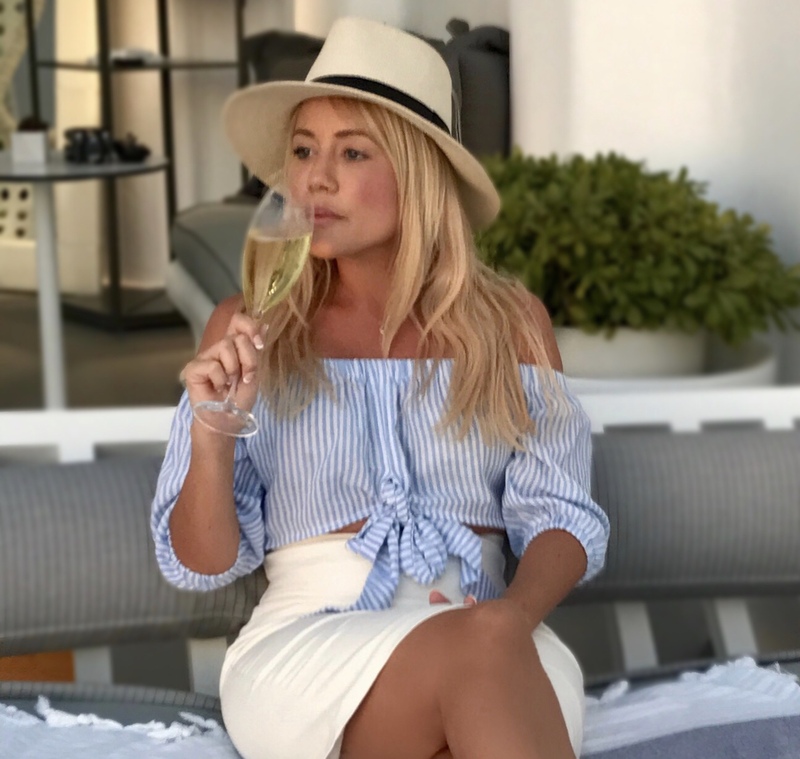 Its clear to see how much Six Senses cares about the longevity of our planet and eco-systems and it feels good to commit loyalty to their brand. Overall Six Senses Zil Pasyon is the ultimate resort for barefoot luxury in an exotic paradise. The full experience was second to none and truly made my trip to Seychelles one of my best vacations to date! Zil Pasyon feels like one big happy family welcoming you with a big hug to their perfect little island. If you get the chance, I truly hope you make it to this magical part of the world. And if you do, make sure to stay with Six Senses Zil Pasyon! Thank you SIX SENSES ZIL PASYON for an unforgettable stay! These images are amazing! Great work! Great post! How long was the full flight from Toronto? it’s really magical !!!! last year the best hotel in the world was in marrakech and was awarded the first place among the top hotels in the globe !!!! pride for tourism in our country.